Preventing incendiary fires in schools is important. Incendiary fires affect school safety- Arson and incendiary fires are a serious problem in schools throughout the United States. School districts across the country are experiencing an alarming increase in school site incendiary fires. For years, the public has perceived incendiary and arson fires as simply a matter for the insurance industry and as crimes with limited impact on anyone other than the insurer. As firefighters who have been injured or killed responding to incendiary or suspicious fires and hundreds of civilians who have been victims of these fires would attest, arson is a significant concern for everyone! Some 500,000 arson fires occur each year. Incendiary and suspicious fires account for the majority of multiple-death fires and are the single largest cause of loss due to fire. One fifth of all property loss is due to arson. Arson is the leading cause of financial losses from fire, exceeding $2 billion annually. Young adults account for 55 percent of arson arrests. Over $2 billion in financial losses from fire are caused by incendiary fires each year. More Than an Insurance Claim Years ago as a firefighter, I witnessed the emotional trauma students and staff experienced following a major fire that occurred late one evening on their elementary school campus. The fire was later determined to be of incendiary origin. 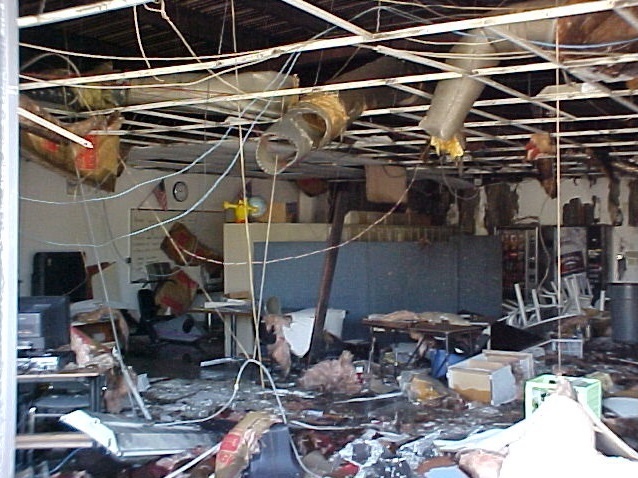 When my engine company arrived, the school library and one classroom were fully involved in fire, necessitating complete overhaul of the structures. Students were visibly devastated when they arrived at school the next morning to find their damaged educational materials and art projects piled up in the courtyard and the library and classroom completely destroyed. A deep sense of loss was evident. In a period of eight years, there were 4,836 such incendiary fires in nonresidential schools, resulting in $37,244,671 in property losses, an estimated $13,874,921 in content losses and 35 injured firefighters reported in the state of California. A recent loss to a school district was estimated between $750,000 and $1,000,000 in property and content loss. Factors usually not considered when calculating the property and content loss of a structure fire include personnel costs, temporary housing, evaluations of structures, and environmental hazards and cleanup. Physical injury and emotional trauma suffered by fire victims are difficult to calculate in tangible terms, however they are significant losses to be considered. Establish a good working relationship with your local fire and law enforcement officials in your area. Report all vandalism to site administration. Install perimeter floodlights outside school buildings and use motion-activated lighting near doors and windows. Consider installing metal clad locks on entrance doors and door frames. Trim shrubs and vegetation low to the ground. Maintaining trimmed vegetation removes hiding places for criminals and reduces easy access to buildings. Consider installing adequate burglar alarm systems, if not already in place. Participate in a neighborhood watch program in the community. Practice good key-entry control that prevents unauthorized entry to school facilities. Keep combustible materials inside and outside of school buildings to a minimum. Maintain automatic sprinkler systems, fire alarms, gas shutoffs and main electrical power panels. Improve automatic sprinkler systems and fire detection systems to remedy identified hazards. Establish a fire/vandalism reporting system for all fires and vandalism regardless of size. Store flammable liquids in locked, flammable storage cabinets. Conduct training activities and student instruction concerning arson. Initiate a master plan for arson prevention involving staff, nearby neighborhoods, community members, fire and police officials. Initiate a school site fire prevention plan.